What does Jammeh have to gain by making The Gambia an Islamic Republic? President Yahya Jammeh has developed a reputation for surprising announcements. What might be the reasons behind his latest? 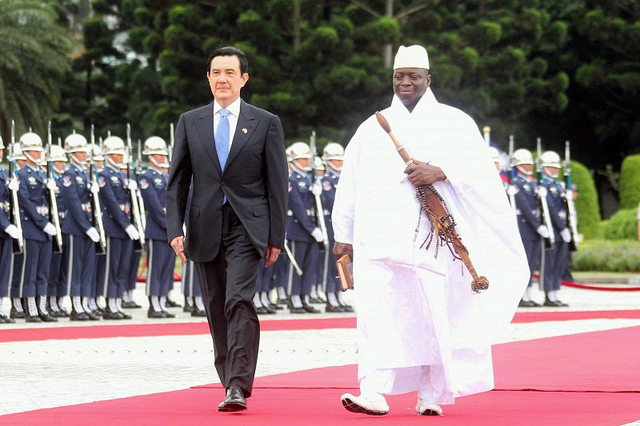 President Yahya Jammeh on a visit to Taiwan before relations were severed. Credit: Taiwan presidential office. In a surprise announcement last month, President Yahya Jammeh declared The Gambia an Islamic Republic. In a state TV broadcast, Jammeh – who has gained a reputation for making unexpected pronouncements since becoming the country’s leader in 1994 – pointed to the fact 95% of the population is Muslim and said he wanted to dismantle any remaining vestiges of colonialism. This side show generated attention in and outside the country, but this back and forth aside, Jammeh’s decision to make The Gambia an Islamic Republic raises a number of important legal, political and religious questions. The motivation behind Jammeh’s declaration is uncertain, but there are a number of possible reasons beyond the official version. One possibility is that the president is attempting to divert attention away from the fact that the country’s economy is faltering, with high unemployment contributing to scores of young Gambians risking their lives to embark on the treacherous journey of migration to Europe. In October, Jammeh called for an investigation into the “frequent and mysterious sinking, capsizing etc. of boats carrying mostly Black African migrants looking for greener pastures in the West only to end up in body bags on European shores”. As important as this may be to highlight, Jammeh could look closer to home where human rights abuses and poverty are widespread to understand why so many are leaving The Gambia in the first place. Another motivation for making the country an Islamic Republic could be as a way for Jammeh to consolidate his rule. For instance, if The Gambia were to adopt a structure akin to Iran’s Islamic Republic in which the Supreme Leader is the single most powerful official, Jammeh could seek this position, giving him even more dominance over executive, legislative and judicial branches of government as well as the military and media. Finally, the decision to make The Gambia an Islamic Republic could be part of a broader strategy of repositioning the country’s foreign relations. Over the past few years, Jammeh has implemented a number of policies that have moved the country away from Western donors. In 2013, he withdrew The Gambia from the Commonwealth; in 2014, the president signed into a law legislation that could see gay people sentenced to life imprisonment; and in 2015, he abruptly expelled the European Union Chargée d’Affaires without any clear justification or explanation. These actions distanced The Gambia from its Western partners and resulted in the withholding of millions of dollars in aid. With the West reducing its assistance and The Gambia failing to attract substantial Chinese attention despite breaking diplomatic ties with Taiwan in 2013, The Gambia is increasingly leaning towards wealthy Gulf States which are less likely to be concerned about poor human rights record and weak rule of law. Jammeh has been on a charm offensive in courting these partners, offering to host the conference on Islamic Civilisation later this year and the Organisation of Islamic Conference in 2018. Making the country an Islamic Republic could be a further sign of this shift in the country’s shifting allegiances. Can Jammeh turn The Gambia into an Islamic Republic? Even for Jammeh, merely declaring The Gambia an Islamic Republic does not make it so. And in order to work out how the country can make the transition, Vice President Njie Saidy has requested that the Gambia Supreme Islamic Council (GSIC) conduct research regarding the exact requirements of an Islamic Republic before legislation is introduced. This may well be true. However, even if these requirements are necessary for Jammeh’s declaration to be made legal, they are unlikely to provide too much of a hurdle. The ruling Alliance Patriotic Reorientation and Construction (APRC) holds 43 of the 53 seats in the National Assembly. And if a referendum is held, its conduct will likely reflect the country’s recent elections which have been characterised by corruption and intimidation. Guessing the motives or future actions of Yahya Jammeh is no easy feat, but one thing he has proven over the past two decades or so is that he usually gets his way. Adolphus Washington is a London-based freelance writer with a focus on sub-Saharan African affairs. 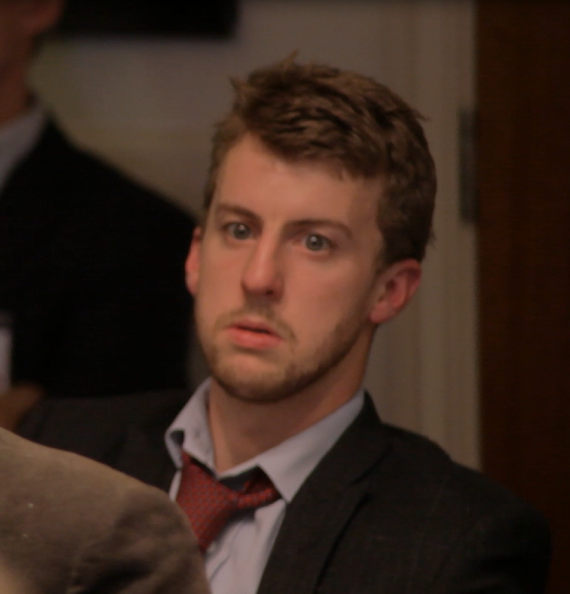 He has an MSc in African Politics from the School of Oriental and African Studies. Defections and deflections: Who now holds the balance of power in Nigeria? This is part of the OIC’s agenda as pronounced by the Abuja declaration of 1994, an Agenda to Islamise Africa, this has generated crisis in many African countries, for instance, the crisis in CAR was caused by an attempt to foist Islam on the entire population of that country, in Nigeria attempts to impose Islamic supremacy in both economic and political affairs of the country has led to stunted growth and development of the country and perpetual religious and ethnic rivalry and hatred, this has made Nigeria the most disunited country of the world, considering the high level of distrust and hatred between the major ethnic nationalities in Nigeria, it is only a matter of time before the country will crumble like a park of cards. But why should this be a concern of someone who’ not a Gambian? I think the people of the Gambia should be left to their bereft caprices. Most Gambians in the diaspora will not agree with your analysis of Jammeh. But hey, that’s the way the cookie crumbles. Like most of these useless leaders in Africa, they would rather hide behind this crap about freedom from our colonial masters, when in actuality, lives were better and more respected under the said colonial masters. Who would have thought that our own people will be our worst enemies. Even, if 95% percent of the Country are Muslims, what happens to the rights of the remaining 5%?. The bottom line, these leaders value no lives than those of their immediate families. But Jammeh is just jumping from one colonial master to another. Those Islamic states in Africa are all willing slaves of Arab cultural colonialism. Gambia is African not Arab. Why do African states not adopt the UBUNTU type of govt esp since it is suited to modern ecological thinking of sustainable lifestyle.”Always something new out of Africa”.It”s unique and already inoculated against new colonialism.